On Channel 5’s Wright Stuff earlier this year, during the newspaper reviews, I came across a product that had been written about by both The Daily Telegraph and The Daily Mail. 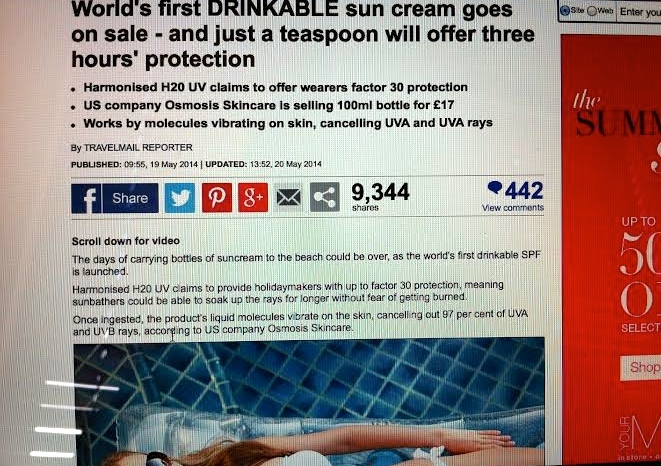 The Telegraph’s headline read; ‘Could this be the first drinkable sunscreen’ and the Daily Mail’s ‘World’s first Drinkable sunscreen goes on sale – and just a teaspoon will offer 3 hours protection’. It certainly grabbed my attention. As skeptical as I was about this product – the reviews on the company’s website are glowing. I am fanatical about sunscreen and as far fetched as the success of this product seemed, if it worked it would have been my new best friend. I couldn’t, however, find a review from an independent source. I decided to place an order from the USA and put it to the test myself. 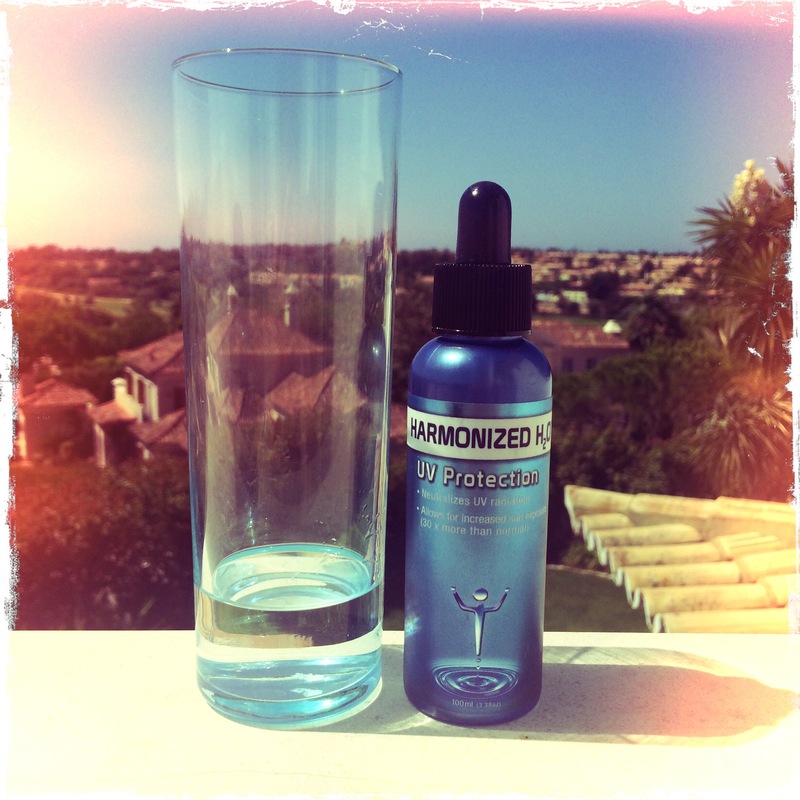 The company Osmosis, who makes Hamonized Water H20 UV Neutralizer, claim that if 2ml is consumed an hour before sun exposure, the frequencies that have been imprinted on the water will vibrate on the skin and will cancel approximately 97% of the UVA and UVB rays before they reach the skin. Founder of the company Ben Johnson claims that although the product will not work for everyone, it will work for over 99% of people. The product is implied to give a sun protection of thirty times – SPF 30. In the Osmosis Pur Medical Skincare water range there are also waters aimed at hangover cures, organ protection, hormone balance and digestive health. The waters – which all consist of 100% water – have been ‘imprinted with scalar waves’ and the company claim to see approximately 90% effectivity in each category. I took 2ml of the product in a glass of water. The bottle makes this easy as the pipette is marked with the measurement. It was midday. After placing a square plaster on my back to keep an area unprotected I covered my body in Loreal Sublime Sun SPF 30. I then removed the plaster, and waited until 1.15pm to go into the sun. I sunbathed on my front for 75 minutes. 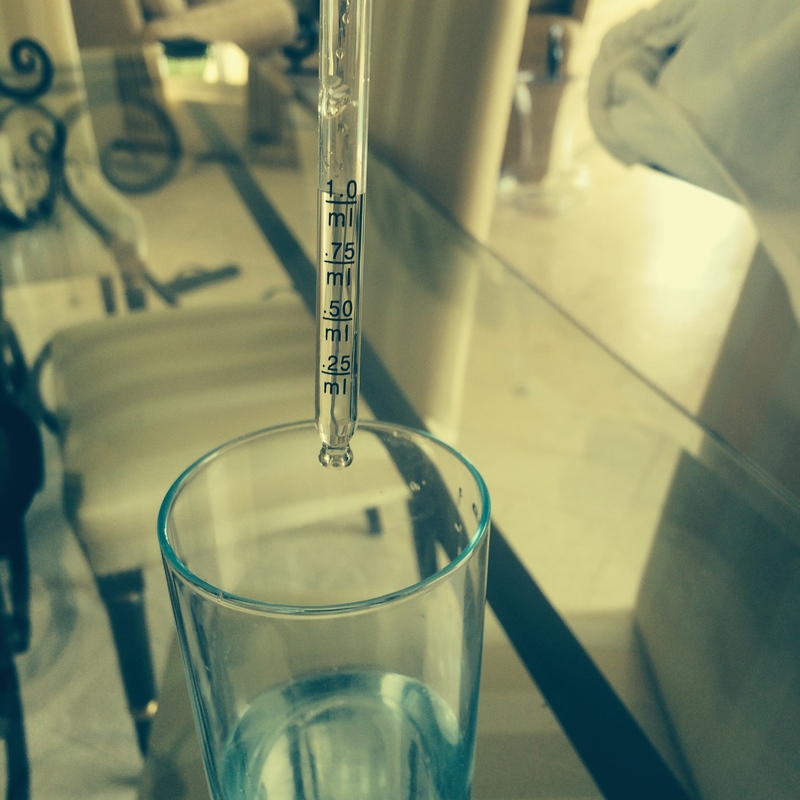 I was in Faro, Portugal and the temperature was 27 degrees Celsius. *The photo of my back was taken in the mirror, the plaster was placed towards the upper part of the left side of my back. I had a clear burn mark in the region that no sunscreen was applied to – the area that had been solely relying on protection from Hamonized Water H2O UV Neutralizer. I had spent less time in the sun than the product suggested I would be able to, and I followed the instructions exactly. I experienced no sunburn on the rest of my body that had been covered with traditional SPF30. Ben Johnson the company founder could claim that I am in the unlucky 1% that the product doesn’t work for. If anyone else independent has tried this product please do let me know your results in the comments section below this post. My personal belief is that the product is a danger on the market, a total waste of money, and should be treated with caution. 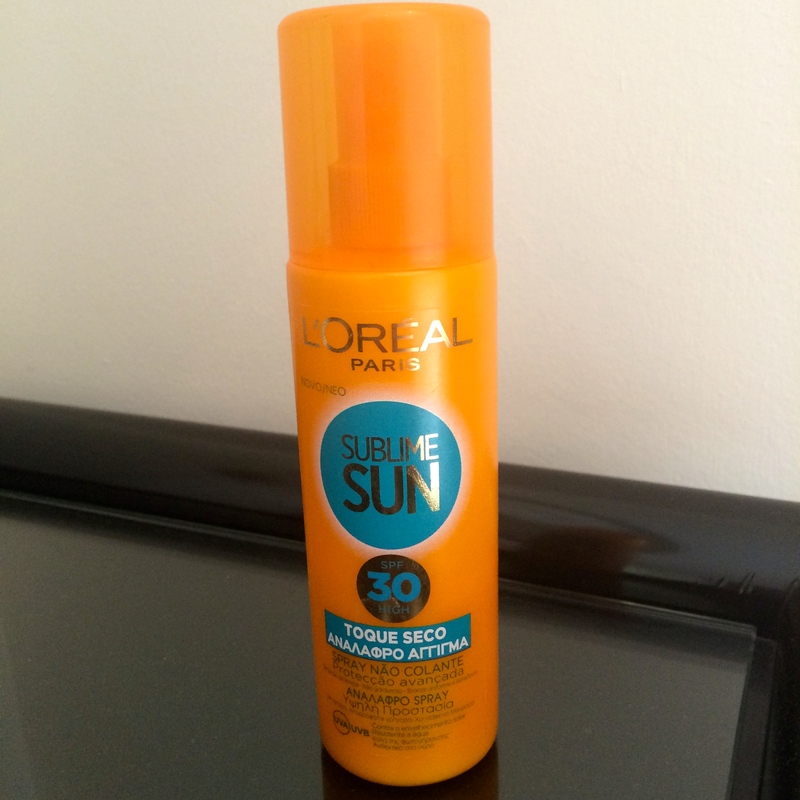 I am grateful that I only subjected a small square of my skin to sunburn whilst trialling this product. It is currently for sale in the UK at http://www.facethefuture.co.uk – a 100ml bottle costing £24.95. Wow Susie; this is very alarming. Well done for doing this experiment and sharing your findings. Hope that burn is not too sore! It’s a bummer it didn’t work for you, but it actually worked for me. I did a similar test, but with my entire arm having no sunscreen. I did not get burned . I then tried it again for 6 days straight using no sunscreen and did not get burned. I was in Orlando Florida spending 8-10 hours a day walking around Disney World Parks. I definitely got a lot of sun. Also friends who were with me used regular sunscreen and got burned on their shoulders. My husband also used the drinkable sunscreen with me and did not get burned, though he takes a while to burn. I have very fair skin myself. So it worked for me, though I didn’t expect it to. Maybe you are the 1%? That is shocking! I’m surprised the American FDA isn’t more stringent. From what I gather, this product escapes the usual rigorous checks of topical SPFs purely because it is administered orally. Alarming that such a non effective product can be marketed. Thumbs up to you for this info. Thanks for the review, really useful. I may have been tempted with this product as applying sun cream sometimes seems like a faff, however, will be sticking to applying the sun cream in future! I was diagnosed with Melanoma about a year ago, and love the sun (obviously). We are vacationing in Puerto Vallarta in the next couple of weeks. 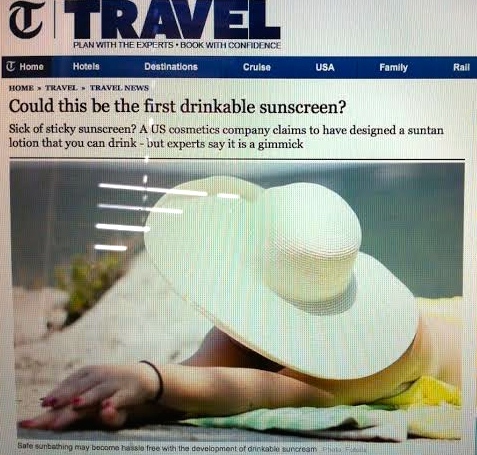 My dermatologist said it is OK to be in the sun, just make sure I wear sunscreen and a hat and DO NOT GET BURNED. I was actually looking for a good sunscreen at my local “spa”, when this product was brought to my attention ($30). Luckily I made sure that I could get a refund if I returned it unopened after doing the research. Thank you so much for this product testing and review. It not only saved me $30, but more importantly I will not take the chance of getting burned. I still can’t get a consensus on what is the best sunscreen that is not greasy – any suggestions?